Sennheiser said the new models were designed for sound engineers, musicians and DJs. Made to exacting specifications at Sennheiser’s German factory on a brand-new production line, the IE 400 PRO and IE 500 PRO will be available from March, 2019. “For the IE 400 PRO and IE 500 PRO, we have reinvented the single dynamic driver principle,” said Jannik Schentek, product manager with Sennheiser. “Other in-ears in the same price range work on the balanced armature principle, which we find to be inferior to a wideband dynamic driver. Sennheiser’s wideband transducer ensures distortion-free, natural sound as it is free from the cross-over effects of balanced armature drivers. This single-driver technology, termed TrueResponse, ensures a natural, clear and spacious sound stage with a total harmonic distortion (THD) as low as under 0.08 percent at 1 kHz and 94 dB. The in-ears come with silicone ear adapters in various sizes and special ear tips made from memory foam, which expand to perfectly fit the ear canal. In addition, the earphones’ ‘sound tunnel’ has two rest positions to attach the ear tips to, to accommodate the variances in length of human ear canals. The biggest difference between the two models is in the mid range. Between 1 and 2.5 kHz, the IE 500 PRO has more presence and sounds much more direct, thus opening up a very wide and deep sound stage. Furthermore, it has a wider frequency response and a few extra dBs of sound pressure level. 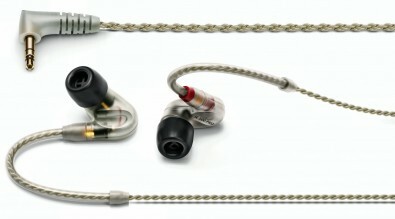 The IE 400 PRO and IE 500 PRO will be available from March and retail at $349 and $599, respectively. Both models are available in a clear and a smoky black version.